Emma’s Country Kitchen is one of the best brunch places in Toronto. 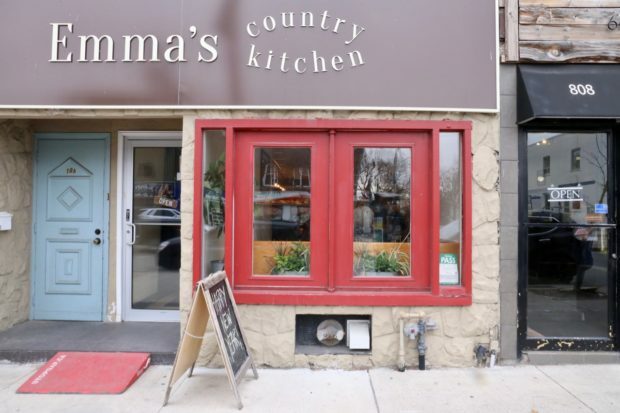 Open since July 2012, Emma’s Country Kitchen is also one of the most popular restaurants on St. Clair. 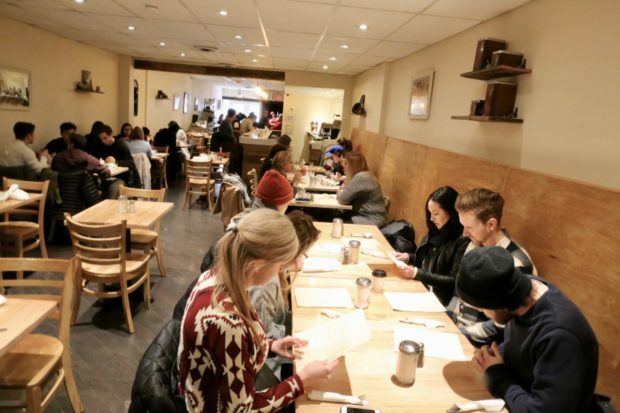 Ranked as one of the best spots for all-day breakfast in Toronto, Emma’s Country Kitchen is open everyday for breakfast and lunch. The kitchen specializes in comfort food faves such as homemade donuts, fluffy buttermilk biscuits, pancakes stacked sky high, and Eggs Bennie. 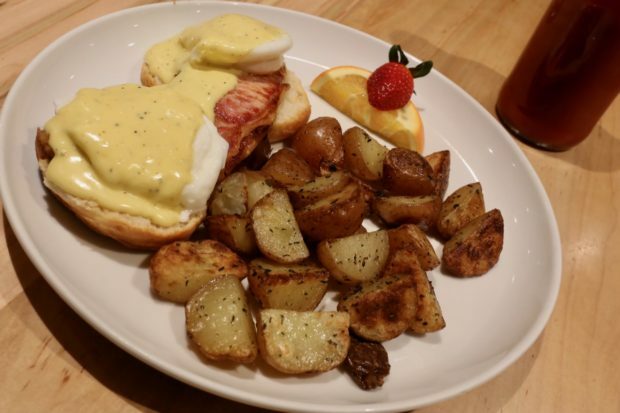 Emma’s Country Kitchen offers the best brunch on St. Clair in Toronto. Step inside this popular St. Clair eatery and you’ll find a small-town diner vibe. The slender dining room features a rose and brown colour pallet, wooden tables, 1970s style country signage, a petite bar and tiny take out counter. Take a stroll through the space and you’ll find a herd of ceramic pigs, vintage frames, and tables topped with glass water bottles sprouting fresh daisies. The place bustles every day of the week so don’t be surprised if you have to put your name on a waiting list on a Tuesday at 2pm. As far as St. Clair restaurants are concerned, this one is definitely worth the wait. 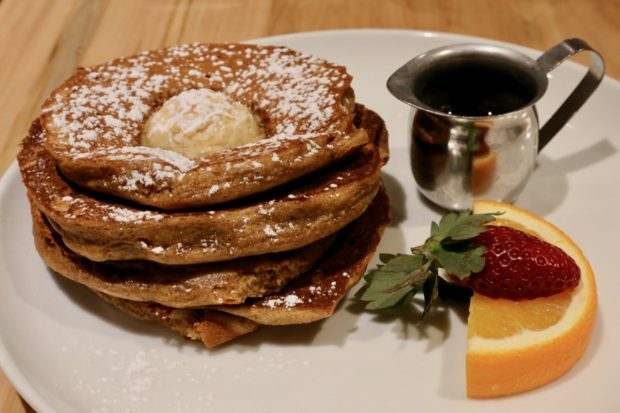 Brunch Spots Toronto: A stack of Gingerbread Pancakes with brown butter and maple syrup. The restaurant is owned and operated by best friends and brunch lovers Rachel Pellett and Heather Mee. Ex-Stockyards head cook Rachel Pellett and her partner Heather transformed a successful catering business into one of the busiest breakfast places in Toronto. So what’s the story behind the name? The duo have paid tribute to the original Emma’s Country Kitchen owned by Rachel’s grandmother in rural Cheltenham, Ontario over 20 years ago. If you’re a homemade donut fan looking to enjoy Sunday brunch in Toronto Emma’s Country Kitchen has got you covered. The bustling St Clair restaurant has been ranked many times over as baking some of the best gourmet donuts in Toronto. Toronto donut fans flock to the restaurant’s pastry case as they’re freshly fried each morning and sell out fast. If you’re a serious Toronto donut lover visiting Emma’s Country Kitchen for the first time, be sure to plan brunch on the weekend as they offer a larger variety of flavours. Past gourmet donut experiments include maple bacon, cinnamon sugar, PB&J, chocolate honeycomb crunch, coffee toffee walnut, and Nutella with toasted coconut. Brunch Places in Toronto: the dining room at Emma’s Country Kitchen. In the centre of the dining room you’ll find a small bar. If you’re arriving alone for a quick bite hop up on a stool and watch as bartenders pour endless cups of coffee and sparkling mimosas. It’s a perfect perch to people watch on the weekend. Those who need a morning wake up jolt can enjoy fair trade sips by Reunion Island Coffee and Tea Squared. You’ll also find a tight list of classic hair-of-the dog brunch cocktails including pitchers of mimosas. A list of spiked teas and boozy coffees sit alongside Ontario craft brews from Spirit Tree Cider and Muskoka Brewery. Emma’s Caesar: Tag No5 vodka, Clamato juice, horseradish, Worcestershire sauce, Emma’s homemade hot sauce. Garnished with a celery salt rim and dill pickle. Seasonal Mimosa: La Delizia Prosecco topped with squeezed pear and ginger juice. The restaurant’s signature Emma’s Benny. Once you’ve scored a seat to one of the best brunch places in Toronto you’ll want to wag your finger down the menu. 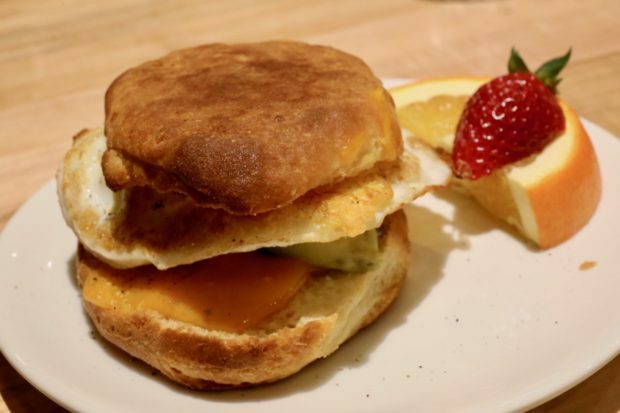 Emma’s Country Kitchen’s signature dish is the Benny, featuring poached eggs over buttermilk biscuit rather than traditional English muffins. Other popular items include baked oatmeal, biscuits and gravy, and lip smackin’ Breakwich. Emma’s Country Kitchen sources all of its meat from local Kensington Market favourite, Sanagans Meat Locker. All of Sanagans products are sourced from local Ontario farms and are hormone and antibiotic free. The kitchen also cures and smokes their own bacon in house and have custom ground sausage delivered on the daily. If you find yourself full after polishing off your plate be sure to take one or two of their gourmet donuts home to enjoy later. 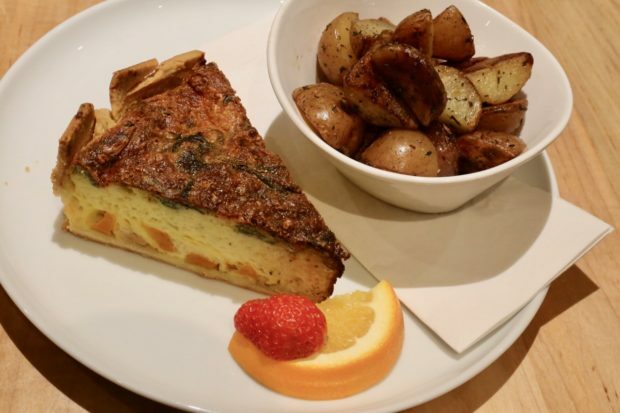 Enjoy a slice of quiche at this all-day breakfast in Toronto. The brunch plates here are hearty and generous. We suggest ordering one savoury main per person and sharing a stack of whatever the seasonal pancakes are between friends as a sweet finish. The Classic: 2 eggs any style, house cured bacon or sausage, crispy grilled red skin potatoes with sea salt and thyme, toast. Emma’s Benny: fluffy buttermilk biscuit topped with house cured peameal bacon, soft poached eggs, mousseline sauce. Served with a side of red skin potatoes. Quiche of the Day: one thick slice served warm with green salad, fruit or griddled potatoes. Gingerbread Pancakes: stack of gingerbread pancakes flavoured with molasses and warm winter spices. Served with whipped brown butter and maple syrup. Apple Cranberry Baked Oatmeal: warm cranberry and apple compote topped with creamy baked oatmeal, brown sugar and pecans and baked until golden brown. Served with a side of vanilla anglaise. Biscuits and Gravy: warm open faced buttermilk biscuit topped with creamy sausage gravy and served with a side of soft scrambled eggs. Accompanied by house made hot sauce. Emma’s Classic Cobb Salad: mixed greens topped with herb roasted chicken breast, hard boiled egg, aged cheddar cheese, house cured bacon, cherry tomatoes and avocado. Tossed in honey mustard vinaigrette. Breakwich: buttermilk biscuit topped with over easy egg, melted cheddar or swiss cheese and your choice of house cured bacon or sage and onion sausage. Granola Parfait: house roasted cinnamon and ginger granola layers with fresh berries and thick vanilla and honey scented yogurt. BLT: house cured bacon, heirloom tomatoes, baby arugula and lemon basil mayo on your choice of bread. Enjoy Sunday brunch in Toronto by biting into the hearty Breakwich.